Did Catersource Cater to its Audience? – Cats, Chocolate + Commas. The Catersource and Event Solutions Conference & Tradeshow took place from March 8 to 11, 2015 in Las Vegas, Nevada. Its purpose is for catering and event planning companies to learn new ideas and skills and connect with their peers in the industry. This year, Catersource says it “assembled another outstanding educational program focusing on the latest trends, and the best business practices, combined with exciting events, networking opportunities, and the most comprehensive Tradeshow in the industry.” Impressively, last year, Catersource won the publication with the Best Overall Event: Business to Business, according to the Minnesota Magazine & Publishing Association. For this week’s assignment, I will be assessing the company’s IMC plan and analyzing how it used social media, along with other channels, to promote the tradeshow. 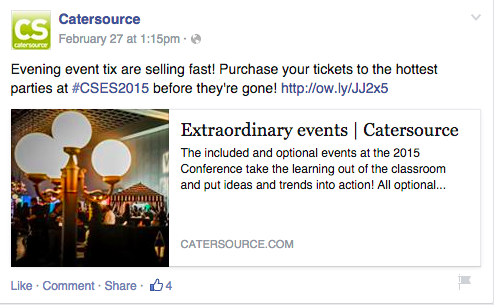 Catersource uses email, its magazine and social media to get the word out about #CSES2015. The company has Facebook, Twitter, Google+, YouTube, Pinterest and Instagram accounts. Yet it hasn’t updated its YouTube and Google+ pages in almost a year; therefore, clearly it will not be using these platforms for the event. In the months leading up to the event, Catersource posted on its Facebook page at least once every day with information on ticket promotions, how to become a participant, where to stay during the tradeshow and more. I think the company should have created a Facebook Event page though to keep track of attendance and directly update attendees that way. During the event, there were just a few posts, which included single photos/albums and let people know some of the presentations that day (below). Two of the days, the company promoted its show guide and mobile app that would help people plan their day and keep track of all the different activities and presentations going on — in my opinion, this should have been every day though. Catersource hasn’t posted since March 10, the day before the event ended; it is not using this network as much as it could be. The company should have at least posted once afterward, thanking attendees for coming and telling them to look out for pictures/other information from the event. However, it did update its cover photo to a picture from the event, while previously it was a picture that said “less than 1 month away” for the tradeshow. Thank you to all of our sponsors, exhibitors and attendees who helped to make this years #CSES2015 truly spectacular! See you all next year! Instagram was another network used frequently throughout the tradeshow. The pre-event posting was quite interesting. In December, Catersource had “12 Days of Holiday Giving” leading up to Christmas — except it missed Day 7 — when it had giveaways for people who registered for #CSES2015 by midnight that day. Dec. 23 was the last giveaway and then there wasn’t another post until March 4 about Catersource’s cookbook that was going to be released at the tradeshow. The company did not hype up the tradeshow on Instagram. During the show, the company posted frequently on Instagram with pictures of the different booths, products, presentations and speakers. At the end of the tradeshow, Catersource thanked sponsors “for helping to put on a wonderful evening.” Instagram is getting more interaction than Twitter, as the average number of favorites for these posts is around 20. This was the only time a booth number was provided too. Of course, Catersource hosts all of the information about the tradeshow on its website. It also sends out monthly email newsletters. 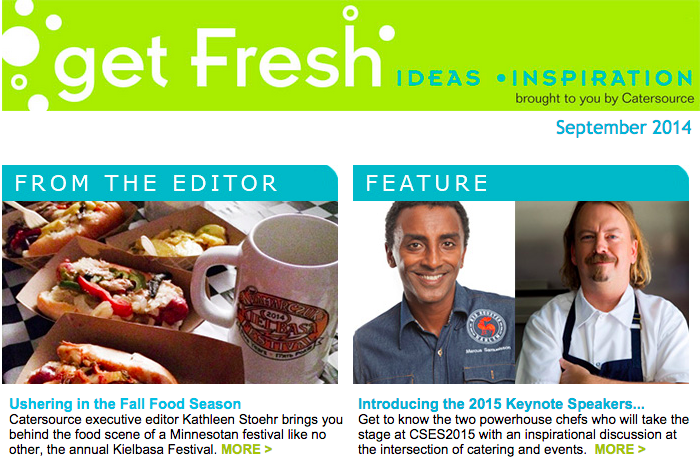 Starting in the August 2015 Get Fresh newsletter, it started promoting the Catersource and Event Solutions Conference & Tradeshow. In the Sept. 2014 issue, readers were given a sneak peak of #CSES2015’s keynote speakers. 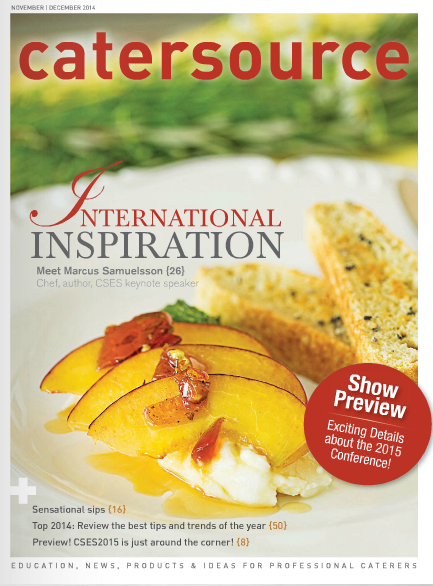 Then in each subsequent issue, different #CSES2015 tradeshow speakers/people were featured, such as former chef Neal Fraser and chef James Beard. Catersource also prints a magazine (along with a digital edition) seven times a year. The tradeshow is promoted in most issues. In the November/December 2014 edition, there was a headline on the cover letting readers know more details about the event. There is a consistent look and feel across all of Catersource’s communications: social media, magazine and email. Except in its magazine, the company tends to use white, green and teal in its marketing efforts. Its standard lowercase name, although sometimes in different colors, is recognizable. 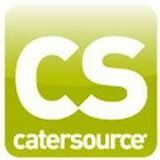 Catersource uses the same icon across its different social media as well, which makes it very easy for users to know that the page belongs to the company. I think Catersource uses IMC well as it promoted the tradeshow across all platforms; however, the event wasn’t promoted as much as it should have been. I’m not sure if this was the first year the app was introduced, but it was a great way for attendees to create their schedule for the day of the events they want to attend, interact with other attendees and take notes. I mentioned a lot of the issues with Catersource’s social media use already, but the pre- and post-event postings were nonexistent or lacking. The event wasn’t hyped up enough. They could have done this by posting pictures of last year’s event, creating a countdown, highlighting specific booths and speakers, and having giveaways, such as its cookbook. After the event, communication seemed to stop. 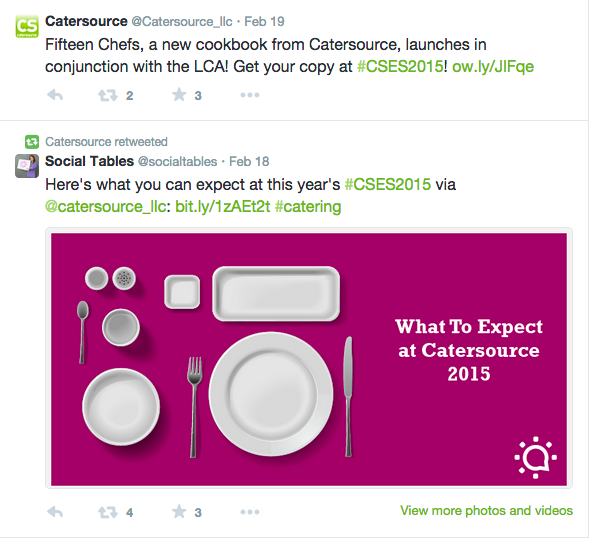 Catersource hasn’t posted on Facebook, Twitter or Instagram since March 11. The website also hasn’t been updated because it says about the event, “There’s still time, register today!” The company should thank attendees, sponsors and others on all platforms. It should also send out an email, personally thanking everyone and inviting them to come back next year, along with event information, e.g., how many people were there, testimonials and photos. A follow-up survey would also be a great thing to send out to ask attendees what the event did or didn’t do well and what people would like to see next year. This shows that the company is interested in feedback and making the event better. The company could also work on interacting with its followers and friends. On Facebook, attendees posted on Catersource’s wall or mentioned it in a post, and the company hasn’t responded. People were also using the #CSES2015 hashtag and the company should have liked, commented or shared these posts. On Twitter, there were also quite a lot of people using #CSES2015. These are missed opportunities for RTs.